Are you looking for the best employee referral program to use in your company? Employee referral is regarded as the best recruitment method. It produces better-qualified candidates, it’s faster and cheaper and the majority of employees recruited through referrals happier and tend to stay longer. This 15-minute guide lists the ten leading employee referral apps and software solutions in 2018. They are all rich in features that make referrals from your employees easy and productive. If you are thinking about starting a referral program in your company or organizations, we have a few tips that will help. 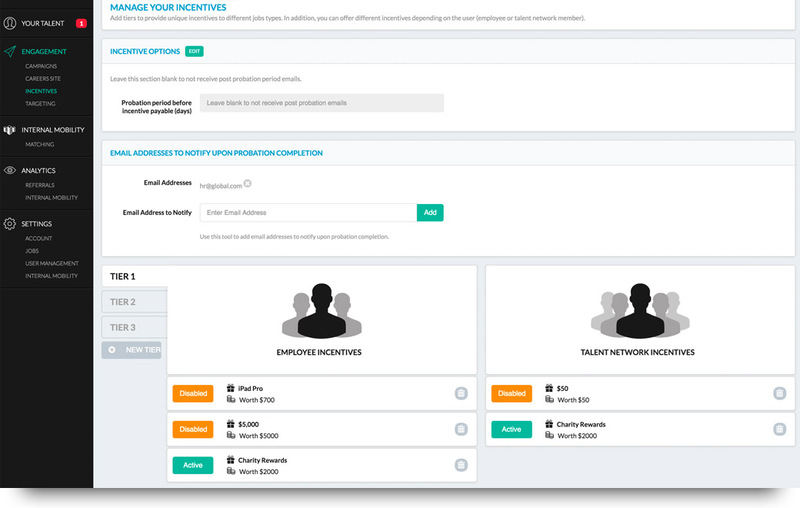 The EmployeeReferrals.com program easily integrates with popular Applicant Tracking Systems (ATS) software including Taleo, Jobvite, and PeopleSoft. Employee referral program gives companies easy to use tools to grow their teams with the right hires. The program uses automation and machine learning to boost your employee referral process and ensure it brings in results. All this information can be easily integrated with your ATS software and payroll. EmployeeReferrals.com makes it easy for your company to hire productive employees faster and more efficiently. Instead of sending the same general referral request to your employees, this program allows you to target each employee with a specific message and incentive. You can even target employees from a specific department. The program is really easy for employees to use. It takes around 2 minutes to complete a referral. They can use it from any device and don’t even have to sign in or register to make a referral. This frustration-free experience makes employees more likely to make more referrals in the future. But it’s not the only way to keep your employees motivated to refer new hires. There are a built-in reward and motivational strategies including employee recognition, raffles, and games. There is also an admin panel where you can track and analyze your referral efforts. The analytics software tracks thousands of data points and presents you with helpful information you can use to tweak and improve your referral program. Some of the metrics you can track include resume submission, recruiter activity, employee engagement and successful referrals. You don’t have to guess what’s working and what’s not. All the data you need is there. Perks World Wide provides some incentives programs to help businesses reward their employees and improve productivity. Their employee referral program gives companies easy to use tools to grow their teams with the right hires.Instead of casting your net wide hoping to catch some good recruits, this program focuses your talent acquisition on employee referrals. Hires that come through the Perks WW program have already been pre-vetted by your employees. They already know a lot about your company’s culture hence the on boarding is quick and they can start producing results faster. They are also highly likely to stick around longer. The Perks employee referral program provides managers and business owners with a wealth of reward strategies. It’s easy to keep motivating your employees to refer more people. Through Jobvite’s employee referral program, you can easily create an army of recruiters out of your employees. The program uses your employees’ social networks to extend your recruitment reach.There is even a dedicated Facebook application with which employees can send private invitations to their friends. Another useful feature is Jobvite Publisher which allows everyone from hiring managers to employees to publish open positions to popular social media networks like LinkedIn, Facebook and Twitter. Jobsite provides employees with easy to use referral tools and gives managers a variety of ways to reward their star referrers. The program also gives you the intelligence you need to track your referral efforts. You’ll see who your best referrers are and the best sources for new hires. The main difference between Jobvite Refer and other employee referral programs is the increased focus on social media networks like Facebook. This provides a wide reach into your employees’ social circles and produces more successful referrals. The best part about Jobvite Refer is that it is part of a slew of recruitment and on boarding programs by Jobvite. If you already use other Jobvite applications such as Jobvite Engage and Jobvite Hire, then this one will be a seamless integration. But it also works great on its own. Zao is essentially an automated job referral machine. It does most of the heavy lifting, leaving you just to post new jobs, set the rewards and track referrals from your employees and those in their circles. Employees can quickly spread the word to their friends through email and social networks. But it’s not just limited to employees. You can get other people closely related to your company such as contractors and alumni to also tap into their circles for hiring leads. A gamification feature adds some fun to the process. Employees compete to be on the leader board where they get recognition for sharing jobs, forwarding a lead or getting a successful referral. Special badges and rewards encourage employees to make high-quality referrals. 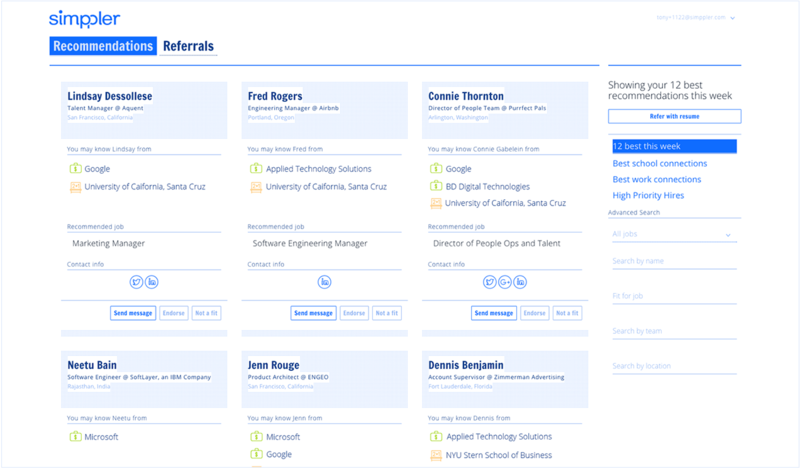 With Zao, you can brand your referral portal for easy recognition and trust by potential hires. You can add your background, text, and videos. After successful referrals, Zao takes care of all reward payments. The program is easy to use with minimal training required for employees and managers. You’ll be up and running in no time. 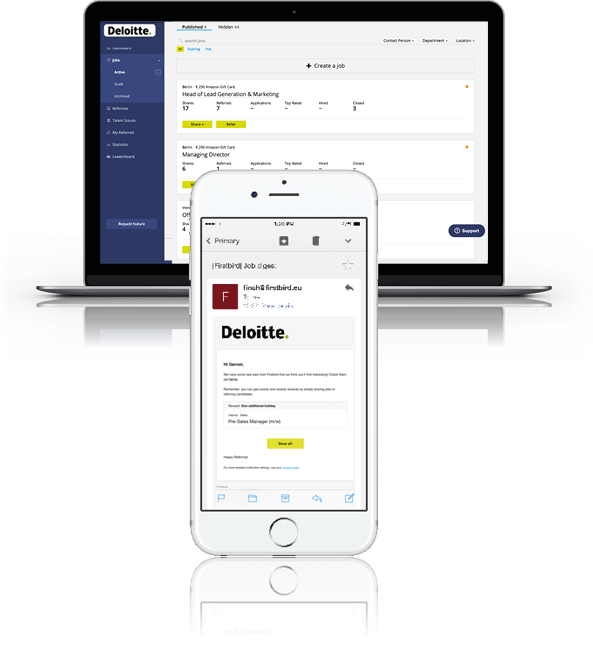 Employees and job applicants can access your referral portal on any mobile device and apply right there. The app provides you with rich analytics to track different data sets and improve your referral efforts. You can integrate it with major ATS programs. One of the biggest challenges for rapidly growing companies –andmost companies generally –is finding many quality hires fast. Simppler makes it easy. This employee referral program is all about simplicity. It engages employees to make more referrals, gives them tools to easily refer jobs to people in their social circles and provides managers with easy ways to track their efforts and reward employees. With Simppler, you waste little time sifting through a mix of good and bad applications and spend more time onboarding the quality referrals you receive. You can keep your team growing quickly without losing cohesion, productivity or your positive workplace culture. Employees can easily connect their social networks to Simppler. The program then uses machine learning and data to find you the best leads from your employees’ networks. Through introductions from your employees, you can recruit new hires quickly and with ease. Simppler connects to major ATS systems so you can easily pass on these hires to your recruitment program. It’s also easy to reward employees for their participation and engage with them for repeated referrals. 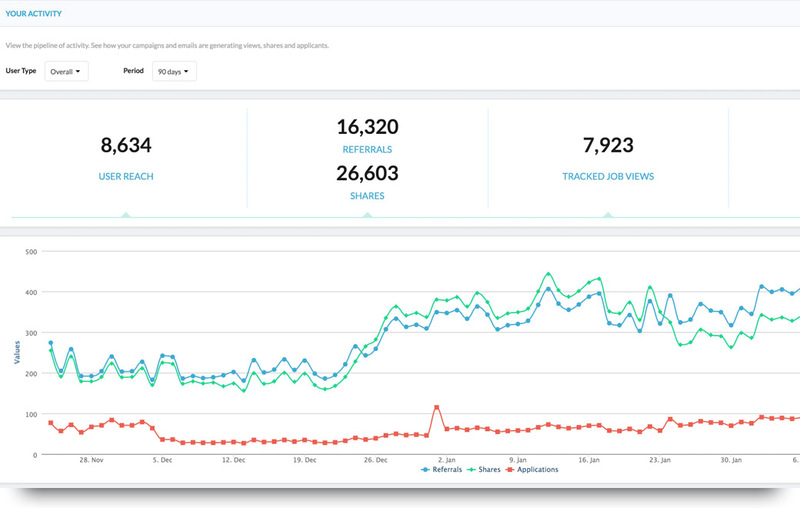 On the backend, Simppler gives you a wealth of analytics and reporting tools to measure your campaigns. You can track how successful your referral efforts are, see bonus payments to employees and analyze employee engagement. There is no need to manually track your employee referrals and referral bonuses on messy spreadsheets. Role Point automates the entire process for you. The result is a cheaper, more efficient and faster way to recruit and onboard new employees. 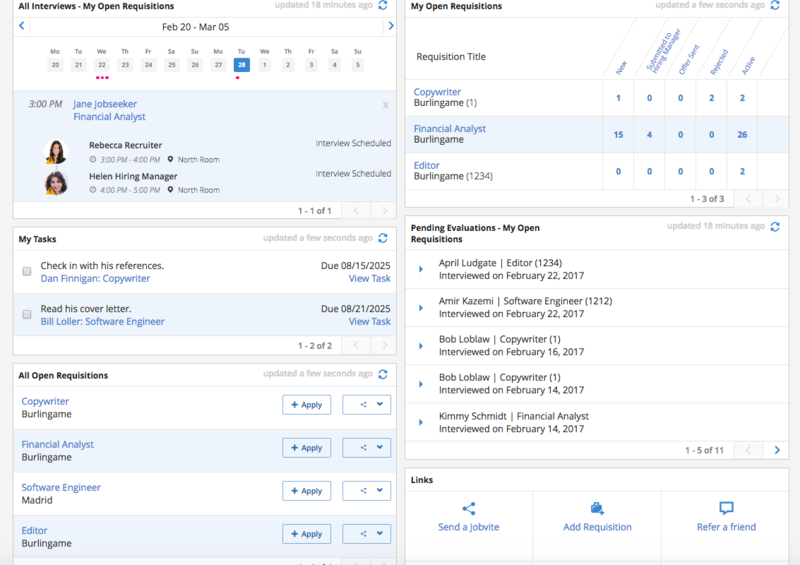 RolePoint integrates with Google’s Cloud Job Discovery to add machine learning smarts to the program. This makes job search deep and intuitive. When your employees search for the best jobs to refer to their circles, they get results that are not only based on a keyword but also on past results and demographics. RolePoint makes employees feel involved in the hiring process. They get immediate feedback for successful hires and receive notifications about the progress of the candidates they referred (e.g., contacted, interviewed, hired). So they don’t feel like their efforts are disappearing into a black hole. The program is very mobile-friendly ensuring employees can make referrals anytime and anywhere. Potential hires can also apply from a mobile device. You can access in-depth referral analytics to help you understand what’s going on and which areas you can make referral improvements. RolePoint is compatible with major ATS software programs. The Reffind app works a bit like Tinder’s iconic swipe feature. While that may sound weird for an employee referral app, it makes Reffind really easy to use for employees. They can make a referral in less than a minute. There are three actions employees can take when they view a job opening. They can swipe left to dismiss it if they don’t know anyone who fits the position, swipes up to snooze if they need more time to think or swipe right when they know the perfect candidate for the job.They can then send them a personal invitation to apply. 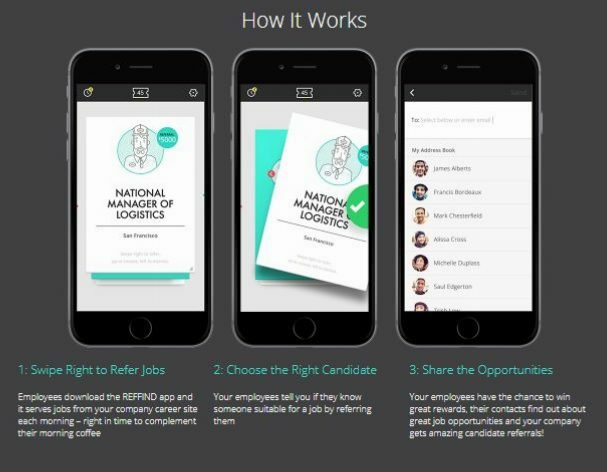 The app serves your employees with new job leads every day.So they can keep referring jobs and getting rewarded for successful hires. 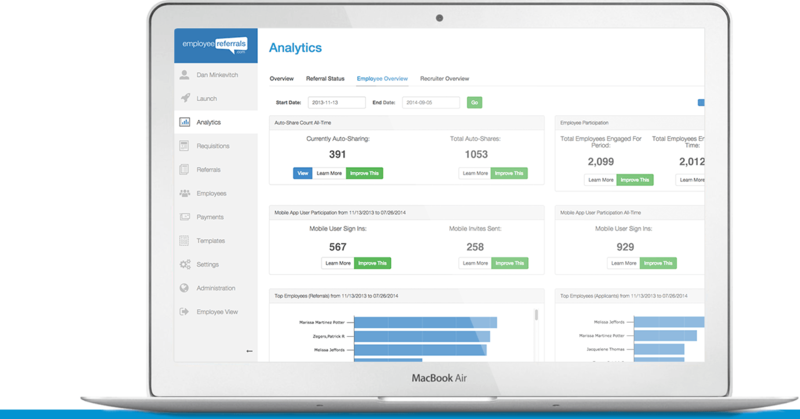 You can track referral success on the main admin dashboard through reports and analytics. Boon allows you to build a working referral program without expending too many resources whether it’s money or time. The program uses automation and machine learning to boost your employee referral process and ensure it brings in results. It’s really helpful especially if you are in an industry where talent acquisition is highly competitive. 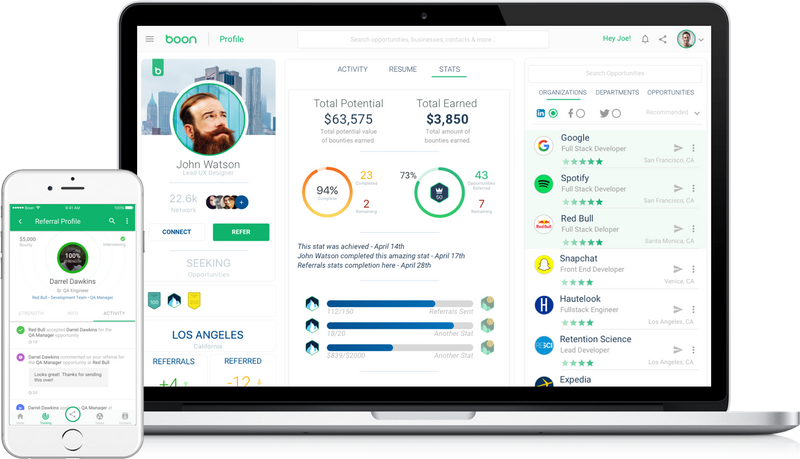 Instead of losing out all the best hires to your competition, Boon allows you to identify quality leads and reach out to them immediately. It does all this through your best brand ambassadors – your employees. It combines the networks of participating employees into one large interconnected network. It then deploys machine learning to find the best-fit candidates and help employees refer jobs to them. As you hire new employees, your referral network keeps on growing. In other words, you’ll never run short of a diverse talent pool from which to find quality hires. Inbuilt custom rewards and gamification motivates employees to keep sending out referrals. They can see where they stand on leader boards and receive progress reports on their referrals. A beautiful dashboard keeps you informed of everything that’s going on. You can measure the ROI of your referral efforts and target areas or campaigns that need improving. 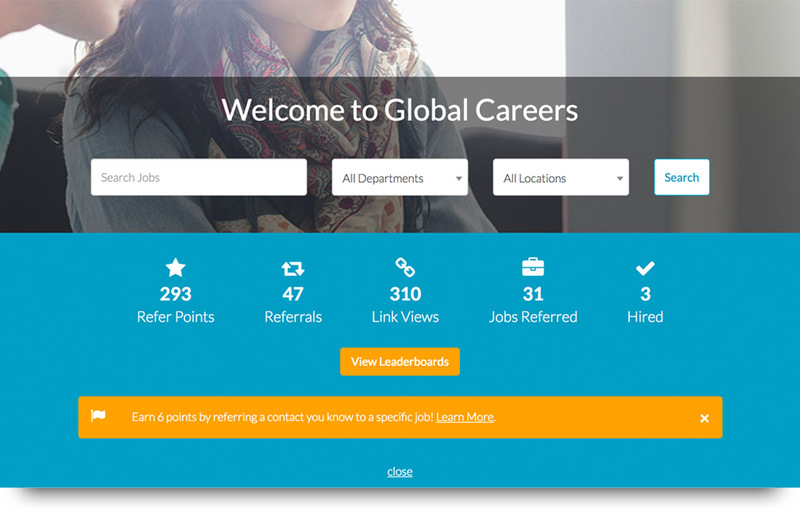 Referagig provides a simple web-based employee referral portal. You can easily add employees to the program from the dashboard. You can also track their progress regarding how many referrals they’ve made and how successful their referrals have been. 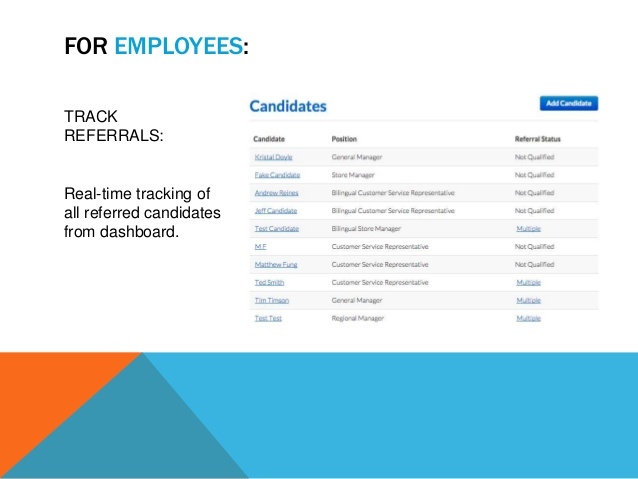 Referagig pulls job openings from your job board and allows employees to choose the ones they want to refer. You can also choose to share specific jobs with specific employees. This allows a more targeted outreach. 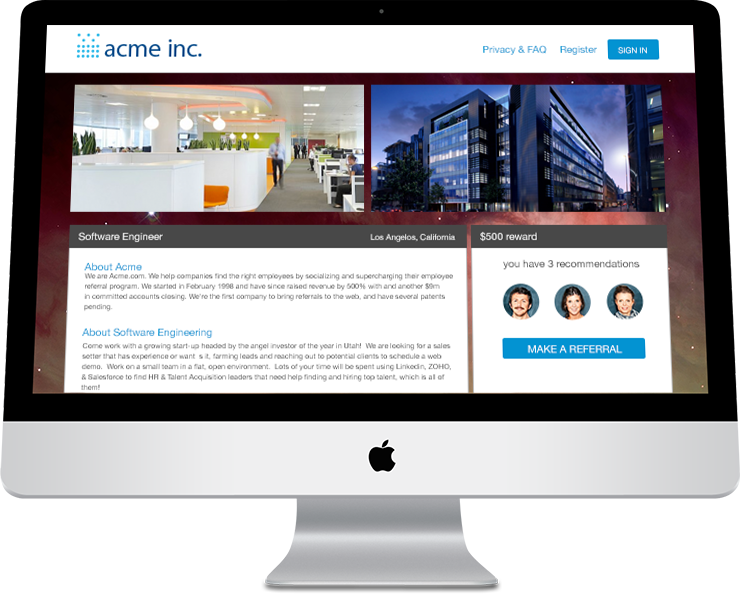 Employees use a simple form to send referrals to people they know. Because the portal is browser-based and mobile friendly, they can fill out the form and make referrals anytime and anywhere. They can also share jobs through social media. On the back-end, you’ll be able to track all the referred candidates. You’ll also receive customized reports regarding referrals, resulting hires and payout rewards to employees. All this information can be easily integrated with your ATS software and payroll. As candidates progress through various stages from the first contact to interview, the program will send regular updates to the employees who referred them. This creates more employee engagement. They are more likely to make more referrals when they know it’s not for nothing. If your company has an international presence, Firstbird is an ideal choice. They have worked with major companies like Deloitte, PWC, and SwissLife to increase the number and quality of hires. Instead of giving you the software and letting you figure it out on your own, Firstbird works with you to determine what your company needs and which referral strategy is ideal. They’ll help you set up a referral program and customize it to your brand. From there you just need to invite your employees to become your company’s ‘Talent Scouts.’ You can integrate Firstbird with your current ATS or job board. This allows Firstbird to recommend the best jobs for participating employees automatically. Employees have several ways to refer jobs. They can send the link privately via email or WhatsApp or share it on social media networks including Facebook, LinkedIn, Twitter and Xing. There is also an option for employees to make an application for a referral. They can submit their referral’s CV on their behalf and forward it to HR. Firebird makes it easy to view referral data and analytics to help you improve the program. Employees compete to be on the leader board, providing some motivating gamification. You can also set up rewards for successful referrals. For employees to be willing to recommend your company to job seekers, they must love working there. Remember that most of the referrals they make are to friends, relatives and close acquaintances. They’ll not recommend a place with terrible work culture. So before you get started with a referral program, make sure your company is a place worth recommending. Consider surveying your employees to find out what they think about the workplace and whether they’d be willing to recommend it to others. If feedback is negative, implement necessary changes before setting up an employee referral program. Otherwise, it’ll just be a waste of time and resources. Implementing an employee referral program brings with it some major changes. Your employees are now part of the hiring team. They expect some reward for their efforts, and you require them to adhere to certain rules. It’s important to have a sound plan to avoid confusion and miscommunication. Here are some of the most important steps to take in the planning stage. Discuss it with your team. Don’t spring the new program on your employees without notice. Talk it over with them beforehand and see if it’s something they’d like to be involved in. Share with them what kind of hires you are looking for. Let them know the exact job requirements such as a certain number of years of experience, a well-written resume and so on. It will help them refer jobs to the right people. Set the terms. Make sure participating employees understand the terms of the program. This includes aspects like rewards, who can participate and any legal issues surrounding the referral program. Let the staff know who is in charge of the program; someone whom they can go to with questions and concerns related to the referrals.This streamlines communication issues. Decide between the in-house vs. third party. You can create your referral program in-house, but it will take time. For big companies, creating a program from scratch is not a big deal. For smaller businesses, a third party employee referral app is better. It’ll have all the features you want – easy referral, social media integration, rewards, tracking, etc. – and you can start using it immediately. This is not something your employees should be spending hours on. A referral is something they do when taking coffee in the morning, during their tea break or in the subway as they travel back home. It needs to be easy, simple and fast. One of the biggest mistakes companies make in creating an employee referral program is demanding too much information from the referrer. It’s as if they are the ones being hired. Don’t ask your employees to list the amount of experience the person they are referring has or where they are working or going to school. That will scare away employees. It should take no more than 2-3 minutes to complete a referral. It should involve just reading the job description and sharing the position via email or social media. Simple as that.Employees will be more willing to come back and make more referrals in the future. As part of this simplicity, make sure that your referral platform is accessible on mobile devices. Employees should be able to make referrals from anywhere. It goes without saying that you should have monetary rewards for participating employees. You can add it to their normal payroll as a bonus or pay it out separately. But don’t just rely on monetary motivation. There much more to motivation than doling out money. Timely feedback, clear communication, personalized engagement – all these are ways you can incentivize your employees to keep referring potential hires. Choose incentives that drive your employees to refer high-quality candidates, not just anyone in their social circle. Good examples of non-monetary incentives include vacations, shopping vouchers, game tickets and other surprise gifts and experiences. For monetary incentives, be very clear about the payout process. Do not leave employees hanging for months after their referral was hired. Send them feedback in time and make sure they know when to expect their well-earned reward. It’s also important to have a fair and easy to understand payout system. Employees should know how much to expect for each referral they make. Have a simple tiered system where you pay flat for each referral and then add money for higher-up or highly technical positions that are harder to fill. Employees also get more money if their referral gets interviewed and even more if they are hired. It’s called gamification, and it can motivate employees to make more referrals. The easiest way to gamify your employee referral program is to add a leaderboard. It should be accessible to everyone within the program. Employees rise on the board based on things like the number of referrals they make, the quality of their referrals and the hiring rate of their referrals. It’s a good way to push employees to recommend qualified people for open positions. Feedback is one of the most crucial factors in the success of an employee referral program. There is nothing worse for employees than feeling like they are wasting their time; like they are throwing names down a black hole with no clue what’s happening afterward. Make feedback an integral part of the program. The simplest way to do this is providing notifications and alerts related to an employee’s referrals. For instance, you can notify them at every stage of the referral’s hiring process. E.g., Contacted, the first interview, reserved for later consideration, hired, etc. It makes employees feel like they are doing something meaningful. Also, consider other forms of feedback. For example, you can share some general referral statistics with your employees at regular intervals. E.g., Wehad 100 referrals this quarter and a 10% hire rate. You can even share how referrals are helping the company. E.g., We spent 40% less money on recruitment this year thanks to your referrals. The point is to create an authentic program that employees feel is worth investing in. I don’t mean that you should approach each employee personally and ask them if they know someone good who can fill a position. Not only are these questions more personal, but they also push employees to think deeper and wider. In other words, the questions are more engaging. Try to replicate the same in your program. On the referral platform, use engaging statements encourage them to share open jobs on their social networks and with their friends. As the program grows, personalize your engagement. You already know that X is a star referrer. A statement like “Thanks for the last great referral you made. Can you help us fill this new position?” is more personalized and engaging. Nowadays there are employee referral apps that can automate this personalization. They use data and machine learning to target different employees with customized messaging and referral recommendations. If for example, a certain employee has more referrals in the engineering department than any other, the app automatically sends them engineering positions for the referral. This is one of the benefits of a ready-to-use third-party software program. As with everything else that happens within the organization, measuring is important. It will help you determine where you are falling short and where you are succeeding. You can create your tracking metrics, but it’s much easier to use a third party program with built-in analytics and reports. Here are some of the areas tracking can help. Determining the most successful referrers. You can then send more referral suggestions their way or customize your engagement with them to encourage even more referrals. Analyze where your referrals are coming from. Is it social media, direct link visits or in-person calls? If it’s social media, is it Facebook, LinkedIn or Twitter? This data helps you plan your strategy to boost referrals. Determine whether employee engagement is working. Experiment with different messages and prompts and see if referrals go up. Track referrals by the department, job positions, experience level, time of year and other metrics. This kind of granular analysis makes the difference between a static referral program and one that’s constantly growing with new employees and referrals. As I mentioned before, it’s a good idea to share some of this analysis with your employees. When they also know what’s working and what not, they can help increase the number of referrals. For example, if they know that LinkedIn is providing more referrals than Facebook and Twitter, they can focus more on their LinkedIn networks. Another reason you should probably opt for a third party program is compatibility with other enterprise software. It’s convenient to have your employee referral program working together with your Applicant Tracking System (ATS). As soon as a candidate comes through the referral program, they immediately get onto the ATS. It was also important to have your referral program integrated with your internal job board. It can automatically pull job listings from the board and present them to employees for the referral. You can also integrate the program with your payroll system for easy processing of rewards and bonuses. Employee referral programs are all about getting your team members to work with you to grow the company. So the most important bit is not the software program you use or the kind of rewards you give; it’s the culture you built. Do the employees feel like can genuinely recommend your workplace to their friends? Do they feel they are considered valued enough by the company that they want to help it grow? Once you build a good culture, the rest is relatively easy. With the right tools, it’s easy to grow your team through employee referrals.